Battery discharge measurement is the time consuming and portable syatem this task is done by many methods used but do not give reliable results. This battery life measurement presented here this circuit using which we can measure the battery life easily by this experiment. 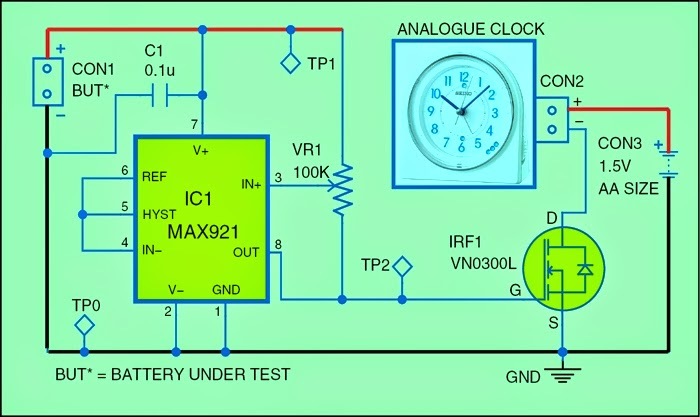 In this project we should use an analogue clock its tracks the battery discharge time used in battery powered portable circuit devices. Fig. 1 Circuit diagram of battery discharge measurement. As per the circuit diagram of battery discharge measurement this circuit shown above Fig. 1. and it is construct using low power single/dual supply comparator Max921(ic1), MOSFET VN0300L (IRF1) and analogue clock and few other electronic components. Here IC1 (MAX921) monitors the life of battery by conducting the battery test and controlling battery supply for the analogue clock. When ever the voltage falls bellow the predefined value these values set by VR1 and IC1 then these outputs becomes falls below which turns off MOSFET TRF1. It means, power supply of the analogue clock is cut off , so that in this condition clock stops running. The reading of clock at the movement gives discharge time of the battery by battery under test. The battery discharge measurement circuit assembling the circuit on PCB,enclose it in suitable diy box or plastic box. Then connect the positive terminal of the analogue clock positive terminal of a 1.5V AA-size battery and negative terminal to the Drain of MOSFET TRF1. Now before going to test the circuit first of all verify the voltages at the test points as per circuit Diagram. Here let us consider if you want to test the 6V battery for measurement of battery discharge, then first decide the minimum threshold voltage, you can say 4.4V. Connect the variable supply to CON1 and set it to 4.5V. vary the VR1 till the clock stops running. 0 Response to "Battery Discharge Measurement by Using the Simple Circuit"